So, I am finally a Sinn-er. My search for which Sinn to get came to a close. I got this watch from my wife for Christmas. Which watch? 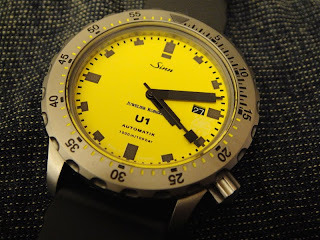 It is the Sinn U1 with a yellow dial. Model number 1010.011R. This is a limited Edition watch that was produced for a German Sinn distributor, Juwelier Roberto. There were 2 limited edition U1, Orange dial and Yellow dial, both a limited edition of 50 pieces. She got this watch new from a Sinn retail shop here in Taiwan. I love the watch. The yellow reminds me of a lemon, hence Sinn U1 lemon. The serial number has been removed for privacy reasons. The limited edition number is in the 30s and it is an auspicious number for the Chinese. I have changed the Sinn rubber strap to this rubber strap. Look out for a review of the watch soon. I will be putting the watch through its paces during the family vacation. When I read the RSS feed -- I thought you were saying you got a 'bad U1', never knew they made a limit edition U1! I am especially interested in the Tigumented (sp?) steel of the case and how it wears. Welcome to the blog. Sorry if it came out the wrong way. Yes Sinn has a number of limited edition U1. The have the U1 Tempus, U Black, U1 Roberto: Orange and Yellow. Then there is the limited production U1 White. As for the Tegiment treatment, for the standard U1, only the bezel has that treatment. The U1 Tempus, White and Black has the full treatment on the case and bezel. As for the Roberto, it is the same as the standard U1. As for the weear and tear, based on what I have read, the treatment is good if not great. 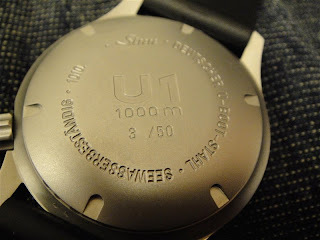 I have seen a U1 with scratches on the body but nothing on the bezel. I just stumble accross your blog here about horology while looking at some Sinn watches in google. Im a sinner too and im happy to read on your blog. I have the U Black edition from my wife too. Now after looking at your yellow U1, which I didnt know they exist, I like to find the yellow or orange one. I've never seen both colours in person or in the magazines before. Your picture is the first one I've ever seen. I wish you could help me on how to get in touch with the yellow or the orange one. I'm itchy to have another sinn soon. Welcome to the blog. Congrats on the Sinn U Black. It is a nice watch. With regards to the yellow or orange Sinn, or the Roberto edition, you can try contacting the jeweler for which the watch was made for, Juwelier Roberto. Their website: http://www.juwelier-roberto.de/. It is in German. The other option is to contact Sinn themselves. I understand they have an orange and a yellow watch in their showroom. I do not know if it is for sale. All the best in the hunt. I am a spanish owner of a Sinn U1n and would like to buy a rubber strap as yours. Could you please tell me where to buy it. Welcome to the blog and sorry for the late response. With regards to the strap, you can get it off the Internet. They are generic rubber/ silicon straps. I can get the straps locally if you are interested.